Autumn Photography in Glacier National Park. Swiftcurrent Lake sunrise and Panorama. Sunrise at Swiftcurrent Lake in Glacier National Park is a fine place and time to plant your tripod legs in the morning. Mt. Gould (left) Mt, Grinnell (center) and Mt. Wilbur (right) reaching into the sun cast a nice reflection in the lake as does Swiftcurrent Lodge. October 2011 found me chomping at the bit to photograph Glacier National Park in autumn, and I asked around to see when peak of fall colors occurred. I didn’t like the answer I received but decided to go to Glacier anyway despite the foul weather that was likely to close Going To The Sun Road to boot. To see Glacier National Park in its entirety there is a small window of time in summer when I am too damn busy to get there. My guiding in Yellowstone and Grand Teton Parks keeps me too busy to travel until after October which is a limiting factor for one wanting to catch everywhere bathed in the warm colors of autumn. Rolling the dice off I went betting that despite the likelihood of closed roads and a probable absence of fall foliage Glacier would offer up images for me to produce. Glacier National Park regardless of season is an escarpment of limestone, and dolomite that still hosts mighty glaciers that carved this awesome land that I had seen far to little of and I was sure I would have no problem filling my memory cards with stunning landscapes. 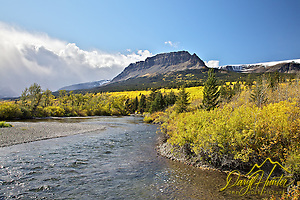 As I drove north across the Great Plains of western Montana in the shadow of the jagged peaks east of Choteau, with each passing mile, the cottonwoods in the river and creek bottoms were surprisingly yellow and the few aspens I came across had a promise of a bit of autumn left in them. Optimism started to grow inside me. 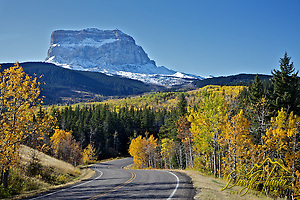 Just west of Browning Montana I crested a hill and laid out before me were miles and miles of golden aspen lining the foothills of the towering glacial sculptures of the Lewis Range of Glacier National Park, and I was stunned. Thank God for bad information. Glacier’s golden hues of autumn begin peaking in early October so late September to mid-October is typically the best time to view fall foliage in Northwest Montana. This is when its deciduous trees include maples, larch, cottonwood and aspen put on their annual show. Maple trees dot the hiking trails and turn to hues of yellow, orange and red. The larch and aspens turn to bright yellows and gold often set in a carpet of Montana’s huckleberry bushes. These trees are often mixed among the evergreens, so the foliage displays the brilliant reds and golds juxtaposed against the greens of the conifers and crowned by the auburns, greys, and tans of the limestone and dolomite peaks. The appearance of fall color varies, because of elevation, late-September to mid-October is typically the best time to view fall foliage in Northwest Montana. The east slope of the Glacier National Park’s Lewis Range in October is clearly one of Montana’s undiscovered treasures. Miles and miles of golden aspen lighting up the lower slopes of this magnificent landscape and nobody is here and the golden slope that lap over into the Blackfoot Indian Reservation.“all is a rewarding time to visit Glacier with the season’s changing colors, abundant wildlife and definitive lack of crowds. The magic of Two Medicine Lake during autumn offers some beautiful cottonwoods around the lake for the visiting photographer. Sinoipha Mountain to the west is a magnificent compositional element for this stunning two-mile long lake and the massive Rising Wolf Mountain soaring 4,400 feet above it to the north is much more than another accent to an already stunning landscape. 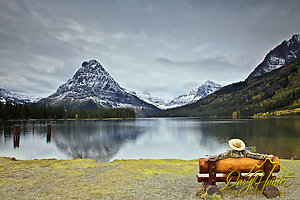 Two Medicine Lake is known for its brook and rainbow trout which is of much interest to the multi-tasking photographer/fisherman. Here, you can find the trailhead leading to the interior of the park, including the Dawson-Pitamakin Loop Trail and Cobalt Lake Trail. Two Medicine Lake is a popular destination for hiking, fishing, camping as well as nature’s elemental therapy for the mind. St. Mary Lake is located just inside Glacier National Park’s east entrance, this ten-mile long water filled chasm under the snow covered peaks above St. Marys Lake cast a beautiful reflection for the lucky photographer who can beat the Montana Wind. Wild Goose Island is a pretty compositional element put in the lake for us photographers. The Going To the Sun Road runs along the north bank of St. Marys Lake but is often closed when fall colors proliferate. Golden cottonwood is abundant along the lake shore. Many Glacier, located on the east side of Glacier National Park west of Babbs, is surrounded by the peaks of the Lewis mountain range. Two lakes can be found here, Lake Sherburne and Swiftcurrent Lake. Lake Sherburne is a reservoir and its low water level in fall diminishes its beauty this time of year. Sunrise at Swiftcurrent Lake in Glacier National Park is a fine place and time to plant your tripod legs in the morning. Mt. Gould, Mt, Grinnell, and Mt. Wilbur sometimes cooperate to cast a fine reflection in the lake, as does Swiftcurrent Lodge. 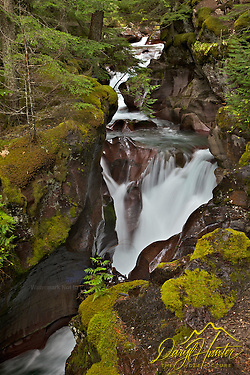 Swiftcurrent Falls is worth shooting as there is a nice grove of aspens between it and Mt. Gould. The Many Glacier area is known for its assortment of hiking trails, lakes, waterfalls, and dense forests, it is also the best place in Glacier National Park to find Grizzly Bears. Just north of Babbs rising abruptly out of the northern plains on the northeast side of Glacier National Park is a most impressive tower; Chief Mountain. The peak is easily seen from Montana and Alberta because of the rapid 5,000 foot altitude gain over the Great Plains which are due east of the mountain. Despite the Chief being mostly in Montana, the distinctive eastern face quickly becomes hidden by the east/west running ridge that makes up Mini Glacier’s northern escarpment. 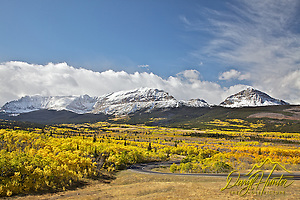 Chief Mountain makes a fine crown for the dozens of square miles of golden aspen at its feet. Chief Mountain has been a sacred mountain to Native American tribes for centuries. The Blackfoot name for the mountain is Ninastiko. The mountain was seen by white explorers in the late 18th century and was known as “Kings Peak” on maps produced in the United Kingdom in 1795. Meriwether Lewis, of the Lewis and Clark Expedition, saw the mountain in 1805 and called it “Tower Mountain.”The name was changed in the late 19th century in reflection of Blackfeet naming of the mountain which was “Great Chief”. When Glacier National Park was created in 1910, the summit and most prominent eastern slopes of the mountain were located within the park, leaving only the lower slopes within Blackfeet jurisdiction. I hope someday my new Blackfoot friend, Glen Stillsmoking, gets the chance to place a Buffalo Skull at the top of the mountain. North of Chief Mountain you run into the Canadian Border crossing which is closed for the season. The west side of Glacier National Park I’d like to see it come out of the clouds someday. These would be the peaks that slow the flow of clouds to the east side that facilitates the stellar fall shooting on the east side of the park. After passing through the west entrance of Glacier, you soon see ten mile-long Lake McDonald which is the largest lake in Glacier National Park. The water is exceptionally clear, making the reflection of the surrounding mountains that much more stunning. A lofty goal considering the west sides’ inclimate weather. Avalanche Creek Canyon however is perfect under inclimate west slope conditions. Avalanche Creek Canyon can be found at the Going To The Sun Road winter road closure not far past the end of Lake McDonald. In October, the elk rut is still happening for those who desire a little wildlife action. Grizzlies can be found at Mini Glacier but I don’t put any effort into wildlife shooting away from home as where I live near Yellowstone I get all I need. The town of East Glacier Park is the best opportunity of lodging during Fall, it is in the Blackfeet boundaries and is part of an area historically and culturally important to the Blackfeet, but abuts the park. There is limited lodging in Babbs at the mouth of Many Glacier Canyon. East Glacier and the west side of the Blackfoot Reservation is my new favorite spot to spend the week surrounding November tenth. I hope to see you there. Posted on Sunday, July 8th, 2012 at 8:57 pm. Filed under: My Places Tags: autumn, chief mountain, east glacier, fall collors, Glacier National Park, Grinnell, mt. gould, Mt. Wilbur, photography, Sinopah Mountain, st. marys lake, swift current lake, two medicine lake	RSS 2.0 feed. Thanks for the recap of shooting at Glacier in the Fall. I hope to make it out this October and found your comments very helpful. Great shots! Thanks Mark, with a little luck I’ll be up there soon again myself. Thanks Ray, click onany photo and it takes you to the Glacier Gallery. Click on any photo you may want to purchase and in the upper left corner there is a buy button. Choose your size then buy. I love the energy fall brigns. Everything seems to be changing and stirring. I always feel a nice burst of motivation this time of year. There’s also that sense of peace and letting go. As my summer garden gives in to the first frosts, I look forward to the time of rest that winter provides. For me, fall is a time to kick back and enjoy life. Warm blankets, hot tea, crackling fires, clear starry nights, gathering with people I love, cooking up the last rounds of produce from the local farmer’s markets, taking those chilly early-morning hikes that get my blood flowing, watching for the first snow. Those are a few things I love about fall. On the 25th, we’ll drive around the park, westward, to Lake MacDonald, where we’ll then be based for the next two nights just outside the park at Glacier Guides Lodge MacDonald Lodge. Any suggestions? I think that is a bit early for autumn color. Don’t miss Bowman Lake at sunrise on the west side, don’t over look the east side of Glacier, it is my favorite. nice article, it’s a beautiful place, I will come here on this summer. Nice pics! I will take some days to come here with my friends this autumn. Every autumn, the valleys and mountain peaks of Montana say goodbye to the green hues of summer and hello to the changing colors of fall. Throughout Glacier Country, we welcome brilliant shades of yellow and gold as aspen, cottonwood and tamarack trees display their seasonally coordinated colors. We are heading up there September 30-October 2nd. Any suggestions for a short two day trip on where and what to see? Have seen many good suggestions on TripAdvisor also. Hi Daryl – thanks for this great write-up! 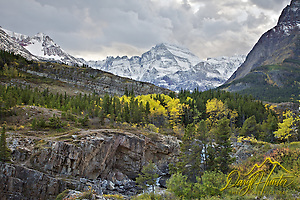 I am planning a fall photo trip to Montana (from Pittsburgh) this year that will include Glacier and Banff. The schedule I am looking at would have me in Glacier sometime around Oct 8-12, for 4 days. I then plan to head up to Banff for a few days before working my way back down to Through Yellowstone for a day and the Tetons for a few days. I have a couple of questions, if you do not mind. 1) Should I come a week sooner, or am I on target? I don’t expect fall color in Yellowstone (I think the best fall color is seen descending the Beartooths, anyway) but hope to in the Tetons (sometime around 10/15) – will there still be fall color? I am traveling with a small travel trailer and can camp without hook-ups, so I am not so worried about finding lodging. I would certainly go earlier. Autumn in the Grand Tetons us usually over by October 1, this is when I like to head to glacier, their color is shortly after ours. Any peak autumn color in the rockies can swing by about a week from year to year. Don’t miss Kananaskis Country on the way to Banff and try to hit Jasper while there. If you go to Jasper find out when the boats to Spirit Island end their season. Kananaskis Country has better autumn color than Banff. If you can swing back into Glacier on your way back from Banff, The larch trees turn yellow about 2 weeks after peak color of Glaciers aspens. Thank you, so much, Daryl. I really appreciate the advice! Hoping the second part of winter and spring into summer produce good amounts of snow and rain. I have my eye on the drought monitor.